So...I get a call wanting to know if would go with a friend to Gastonia - and while there, we could go by Mary Jo's and Sew Much Fun, hmmmm...lets see....YES! We connect with a third friend and off we go for a fun day of shopping, lunch at Olive Garden and just some good girl time. I found the pattern for this cute bag at Mary Jo's and the fabric at Sew Much Fun. Can you guess what it is?????? An iron caddy of course! I just love this, it is a pattern by Sisters' Common Thread and I had so much fun making it. A word of caution to those of you that are like me and think you can just look at the pictures in a pattern and make it - you gotta read these instructions a couple of times and take it step by step! 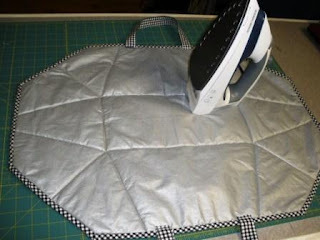 The bag opens up flat to make an ironing surface. Just right for taking the iron with you to workshops. 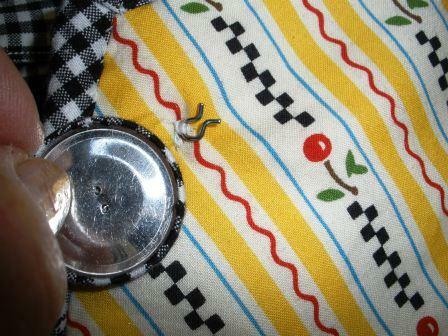 There is the layer of metallic like ironing board fabric on the reverse of the mat, and a Insul-Bright inside. The pattern calls for two layers of Insul-Bright, or two layers of cotton batting, or 1 layer of Warm Tater, whatever that is. I elected to use one layer of cotton batting and one layer of Insul-Bright, which worked out great. Did you notice that cute covered button on the bag up above? I thought that would be really cute and also cheaper than buying big buttons. As soon as I buttoned it, this happened! Yep, the shank came right out of the button. So I went to my button jars and found a couple of white buttons. Guess that would be better than the covered button -- but I sure did like that covered button. All in all, it was a fun project and I hope to make a few for my guild's boutique at the quilt show. 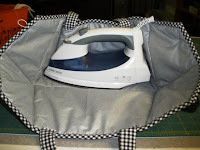 It really is a cute iron tote, and one you can put your iron in even if it is still a little warm. Not sure I would put it in there if it was really hot, as I would think it would scorch the bag, just like a hot iron can scorch your ironing board cover...a lesson I know all too well. I love this! Thanks for sharing your darling caddy! Your iron caddy turned out very cute. I have a kit for that caddy that I got more than a year ago... I guess it has aged enough... I should find it and put it together. You have inspired me! Wow -- that's adorable Teresa! What a great idea to have one for retreats. Thanks for showing it to us! Very cool! Love the binding you chose for it. I want to go to Mary Jo's!!! cute iron caddy. love the binding. too bad about the button. I've seen this made before and still think it's such a clever pattern. I like your fabrics and it turned out really nicely. I'm sure you'll make good use of it. Love the iron caddy. I purchased this pattern also, but have not taken time to sew it up.